The Travis County Commissioners Court voted unanimously to approve Central Health’s Fiscal Year (FY) 2019 budget and tax rate on Tuesday, Sept. 25. The vote came after Central Health requested a week’s delay to allow its Board of Managers an opportunity to reconsider the future of Sendero Health Plans, the health care district’s nonprofit Health Maintenance Organization (HMO). 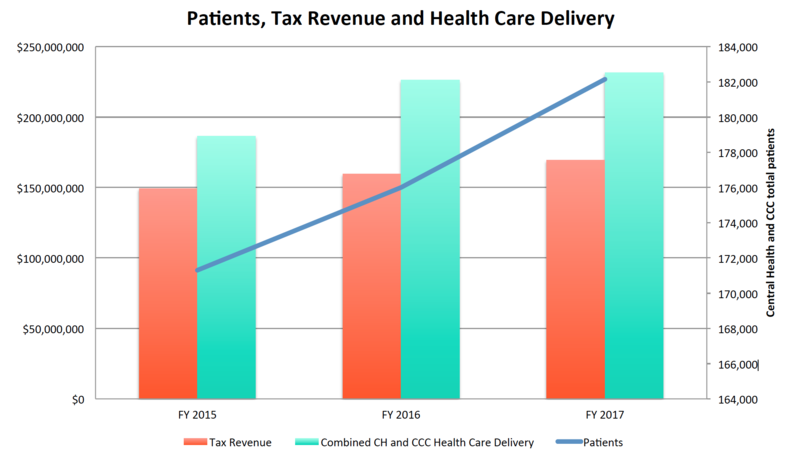 The Travis County Healthcare District d/b/a Central Health will hold two public hearings on a proposal to increase total tax revenues from properties on the tax roll in the preceding tax year by 6.0 percent (percentage by which proposed tax rate exceeds lower of rollback tax rate or effective tax rate calculated under Tax Code Chapter 26). Your individual taxes may increase at a greater or lesser rate, or even decrease, depending on the change in the taxable value of your property in relation to the change in taxable value of all other property and the tax rate that is adopted. The first public hearing will be held on Wednesday, August 29, 2018, at 6:00 p.m. at Central Health Administrative Offices, 1111 East Cesar Chavez Street, Austin, Texas 78702. The second public hearing will be held on Wednesday, September 5, 2018, at 5:30 p.m. at Central Health Administrative Offices, 1111 East Cesar Chavez Street, Austin, Texas 78702. FOR: Guadalupe Zamora, Chairperson; Sherri Greenberg, Vice-Chairperson; Charles Bell,Treasurer;Abigail Aiken, Secretary;Katrina Daniel, Board Member; Shannon Jones, Board Member; Maram Museitif, Board Member; and Cynthia Valadez, Board Member. ABSENT: Julie Oliver, Board Member. 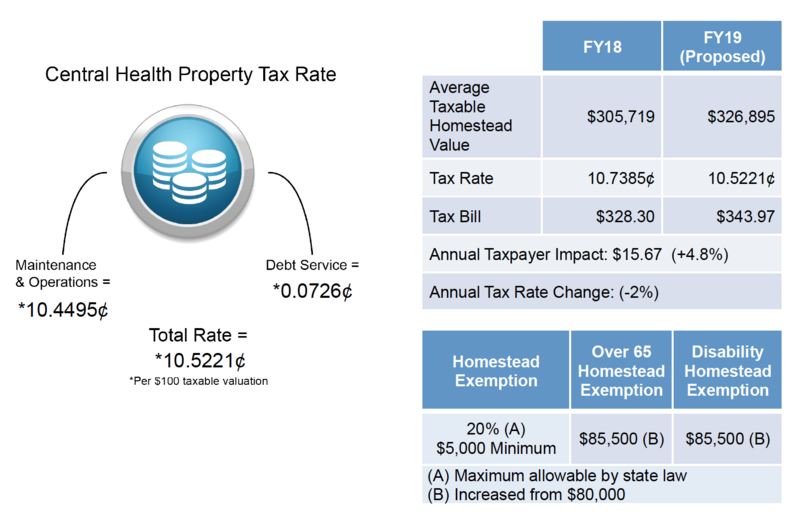 The average taxable value of a residence homestead in Travis County Healthcare District d/b/a Central Health last year was $305,719 (average taxable value of a residence homestead in the taxing unit for the preceding tax year, disregarding residence homestead exemptions available only to disabled persons or persons 65 years of age or older). Based on last year’s tax rate of $0.107385 (preceding year’s adopted tax rate) per $100 of taxable value, the amount of taxes imposed last year on the average home was $328.30 (tax on the average taxable value of a residence homestead in the taxing unit for the preceding tax year, disregarding residence homestead exemptions available only to disabled persons or persons 65 years of age or older). The average taxable value of a residence homestead in Travis County Healthcare District d/b/a Central Health this year is $326,895 (average taxable value of a residence homestead in the taxing unit for the current tax year, disregarding residence homestead exemptions available only to disabled persons or persons 65 years of age or older). If the governing body adopts the effective tax rate for this year of $0.099322 (effective tax rate) per $100 of taxable value, the amount of taxes imposed this year on the average home would be $324.68 (tax on the average taxable value of a residence homestead in the taxing unit for the current tax year, disregarding residence homestead exemptions available only to disabled persons or persons 65 years of age or older). If the governing body adopts the proposed tax rate of $0.105221 (proposed tax rate) per $100 of taxable value, the amount of taxes imposed this year on the average home would be $343.96 (tax on the average taxable value of a residence in the taxing unit for the current year disregarding residence homestead exemptions available only to disabled persons or persons 65 years of age or older). The budget supports Central Health’s Strategic Work Plan, which outlines three overarching objectives along with specific strategies and activities to achieve each objective. Download our FY2019 Proposed Budget Book to read in detail about our proposed budget and the data we used to develop it, as well as our final financial audit for FY2017. Community Conversation: From Tax Dollars to Health Care March 2, 2018 The public learned about the Central Health budget development process and the Central Health Strategic Work Plan. The public discussed recommendations from a third-party performance review of Central Health and provided feedback to help develop new strategies for the Central Health Strategic Work Plan. April 5, 2018 The public prioritized community-proposed strategies for inclusion in the Central Health Strategic Work Plan. Board of Managers’ Budget and Finance Committee Meeting May 16, 2018 The committee discussed the new proposed strategies for inclusion in the 2019 budget. Central Health 2019 Budget Engagement Survey July 25 – August 20, 2018 Survey to gather public input on 2019 Central Health-funded activities. Community Conversation: the 2019 Budget July 31, 2018 The public provides input on 2019 Central Health-funded activities. Travis County Commissioners Court August, 14, 2018 Central Health presents 2019 budget to Travis County Commissioners. Central Health Board of Managers Meeting August 15, 2018 Staff present 2019 budget to Central Health Board. Central Health’s Budget First Public Hearing August 29, 2018 Central Health Board receives public input on the 2019 budget. 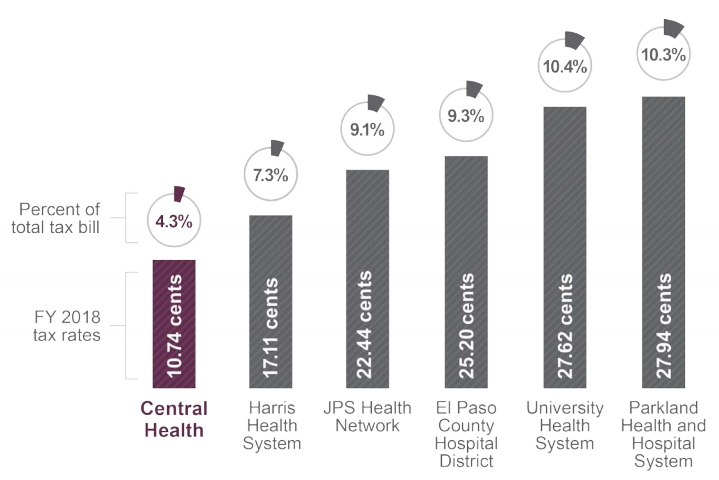 Central Health’s 2019 Budget Engagement Report August 31, 2018 Central Health’s 2019 Budget Engagement Report is published. Central Health’s Budget Second Public Hearing September 5, 2018 Central Health Board receives public input on the 2019 budget. Central Health’s Board of Managers Meeting September 12, 2018 Central Health’s Board votes on 2019 budget. Travis County Commissioners Court September 18, 2018 Travis County Commissioners Court votes on Central Health 2019 budget. Board of Managers approve tax rate and budget on Sept. 12. Public Hearing 2 on September 5. Public Hearing 1 on August 29. The Board of Managers discussed the proposed budget and tax rate on August 15. The Board of Managers Budget & Finance Committee discussed the proposed budget and tax rate on August 8. The Board of Managers discussed the proposed budget and tax rate on July 25. The Board of Managers Budget & Finance Committee received the budget timeline and a five-year financial forecast on June 13. The Board of Managers Budget & Finance Committee received the budget timeline and a five-year financial forecast on April 18.